Elena has been part of spoon-billed sandpiper conservation work since 2000 – her first year in Chukotka. She works for the Institute of Geography, Russian Academy of Science and runs the database for spoon-billed sandpiper breeding records. 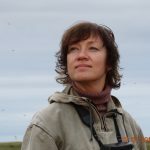 Elena’s main area of expertise is the spatial distribution of Arctic waders and she is the lead author of the Atlas of Breeding Waders in the Russian Arctic. Elena spent 14 summers surveying the known breeding locations of spoon-billed sandpiper from Belyaka Spit in the north to the Korayk coast in the south, working with Heritage Expeditions. In 2012, she organised the first spoon-billed sandpiper education exhibition at the Anadyr Museum (Chukotka capital). Elena has also participated in surveys of spoon-billed sandpiper staging and wintering sites in India, Myanmar, Thailand, Vietnam and China.